Leo Villareal is the most prominent light sculptor of his generation. In 1997, he abandoned his work with interactive television and began creating sculptures in which he combined strobe lights, neon, and most recently, LED bulbs activated by the artist’s own custom-made software. The magic of Villareal’s work lies in its sequencing. Thousands of tiny white LEDs may resemble a starry night as seen in a planetarium, while tubes of colored LEDs masked by a diffuser are like a Monet painting of water lilies set in motion. His hypnotic and exhilarating light sculptures will be appreciated by both the young and old, experienced and inexperienced art viewers, students of both the arts and sciences, and engineers who will be tempted to analyze the artist’s algorithms. This is the first museum survey of the groundbreaking work of Villareal, whose stunning manipulations of light and color are internationally renowned. Villareal’s work is unique in that it bridges the subculture of technology with the broader international contemporary art world. Although his work is reliant upon computers, it is not “about” technology. 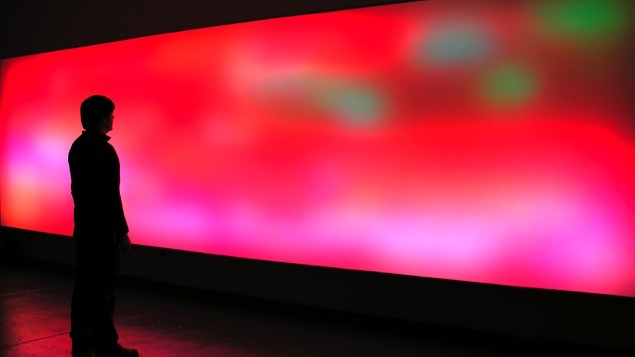 Computers are necessary to drive the light sequences that compose his work, but he deliberately uses code that is simple and pared down, focusing instead upon the sequences, inspired by the mathematical formulae that form the basis of patterns found in nature.